Crowns: Are you self-conscious about your cracked, broken, decayed, or worn down teeth? Dr. James Holt at Holt Dental Care in Southlake, Texas, can give you the smile you have dreamed about with an all porcelain, fully ceramic crown or bridge. Return structure, strength, and function to a tooth with extensive decay or damage. Designed to fit snugly and function as a healthy tooth. Protect your tooth from further damage and preserve the jaw’s correct natural alignment. At Holt Dental Care, we use precious metal, porcelain pressed (or fused) to metal or all-porcelain crowns. To maintain a fully white smile, we recommend all-ceramic crowns. Looks: Our precise color-matching system allows us to find the right shade of porcelain to blend with your natural tooth color. 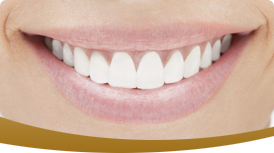 Durable: Porcelain crowns are extremely durable, making them popular with dentists as well as patients. Fast: We can typically design, fit, and place your crowns in a few short appointments. Natural: Once a crown is placed, you can care for it as you do your natural teeth. Conscientious brushing twice a day and daily flossing will protect the base of your crown from bacterial growth. Be sure to see us at least twice a year for professional cleanings and a preventive exam, too. Missing teeth? Gaps in a smile can undermine the structure that supports your cheeks, making you look years older. Appearance, confidence and image can suffer. Using a bridge, we can fill the gap and restore your full, fresh smile–and your confidence. Dental implants are another alternative for prosthetics. To schedule your visit for a new crown or bridge, call us at Holt Dental Care at 817-488-2273.